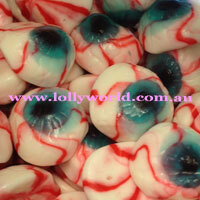 Bloody Eyeball Lollies would be great to make your cupcakes scary for Halloween. Make a ghoulish cake and just have some fun with these squishy fun lollies that appear to stare at you. There are roughly 20 eyes in a 190g bag.